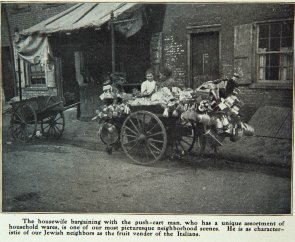 Caption: "The Housewife Bargaining with the Push Cart Man, who has a unique assortment of household wares, is one of our most picturesque neighborhood scenes. He is as characteristic of our Jewish neighbors as the fruit vendor of the Italians." Man pushing cart filled with housewares, selling goods to two women. "Starr Centre Association Annual Report, 1904," Philadelphia: Starr Centre Association. P. 2.